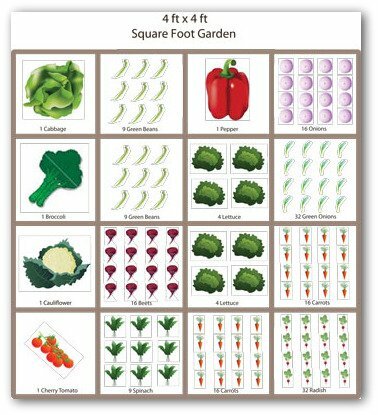 Use our free plans for first vegetable garden layouts and designs! 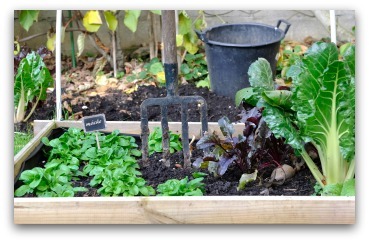 Here are some easy tips, plans and ideas for starting a beginner vegetable garden at home. We offer basic vegetable garden planning and a planting guide to help you get started. Is it time to plant your first vegetable garden ever? Don't get overwhelmed; keep it simple and you will be successful. 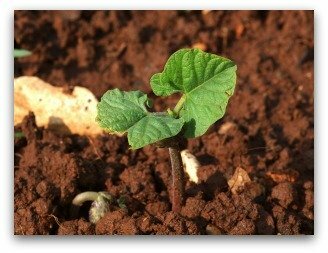 It is usually best to start with a small vegetable garden for your first gardening venture. A few vegetable garden basics are all you need when beginning vegetable gardening. You will save money too, if you don't go overboard buying more than you need to get started! Provide rich well-drained soil for your plants. Choose a sunny location for your garden. 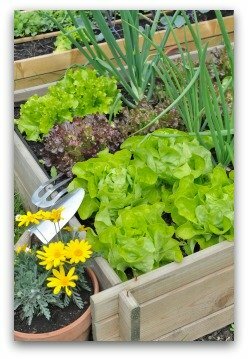 Place low-growing crops on the south side of your garden. 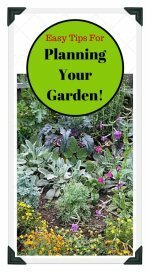 Plant tall growers on the north side of your garden. First vegetable garden growers may want to start small. 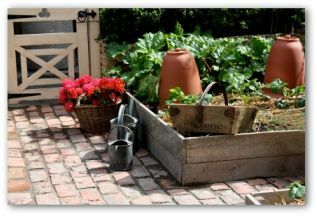 A "square foot" garden is a great and simple way to get started. Simply build a 4 x 4 foot frame using 2 by 6 lumber. Use string or narrow strips of wood to divide the box into 16 sections. Fill container with enriched potting soil. 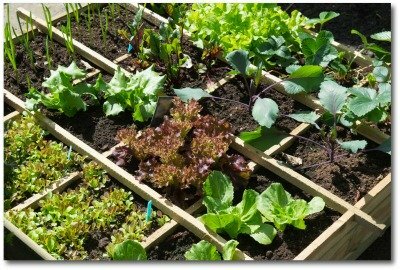 Plant each square with a favorite vegetable! 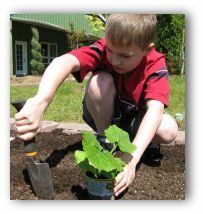 Click here for additional first vegetable garden plans, layouts, and designs. Tomatoes: Plant one cherry or dwarf tomato per square foot. 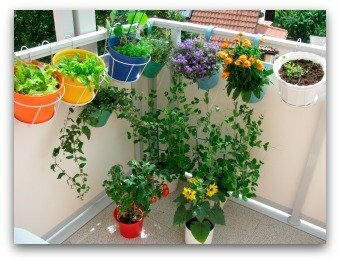 Use a cage to support the plant and keep it from sprawling over your other plants! Beets: Plant 16 beets per square foot. Onions: Plant 16 onion sets per square foot. If you are planting green onion seeds, you can plant 32 seeds, and thin the plants when the "extras" are about 6 inches tall. Broccoli: Plant one transplant per square foot. Cauliflower: Plant one transplant per square foot. Spinach: Plant 9 spinach seeds per square foot. 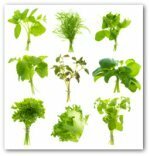 Again, if you plant a few extra seeds, you can thin them to 9 plants when they are large enough to eat. Radish: Plant 32 seeds per square foot. Radishes grow quickly, and can be harvested 3-4 weeks after planting. Replant every 3 weeks to ensure continuous crop. Really large plants such as squash, watermelon, zucchini, cucumbers and corn will try to "take over" your square foot garden. Try planting these larger plants in your flower bed, or in a special garden area where they have plenty of room to spread. Good care consists primarily of keeping the soil moist. When your first vegetable garden bed begins to dry, plants should be watered thoroughly. Make sure your pots have good drainage. Vegetable gardens grow best in the open away from trees and scrubs. Vegetables need plenty of sunlight. Tomatoes set few fruit, lettuce plants bolt to seed, and beets wither because of the heat, not the light. If you notice standing water or a sour smell after a rain, your garden soil may have a drainage problem. Shallow rooted vegetables can be set in raised beds mounded six inches or more above normal ground levels. 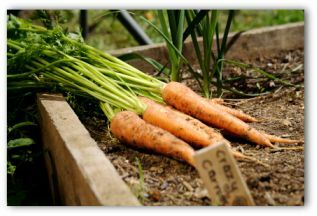 On wide mounds, two or more rows of vegetables such as beets, turnips, carrots, and lettuce can be planted close together. Beneficial natural fertilizers include compost, peat, leaves, and lawn clippings. 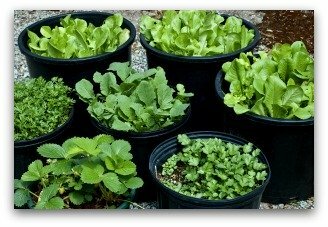 Purchase or formulate your own soil mix for container gardens or for growing seedlings. A simple mixture of peat and perlite will have you growing like the pros in record time. Main ingredients: peat moss, vermiculite, dolomite lime to adjust pH. Add fertilizer to the mixture or apply after the seedlings sprout. Begin fertilizing plants immediately after germination. Formula makes enough mix to fill three six-inch pots. First time gardeners are often in a honeymoon phase of sorts: Everything is progressing smoothly with minimal effort, then wham, the insects invade as if a "Free Lunch" sign is planted in the garden! Scarecrows are not much of a deterrent to a pest infestation. Pesky vegetable garden pests to watch for include aphids, beetles, caterpillars, stinkbugs, and weevils. Nematodes can lay the groundwork to destroy roots of future vegetable garden plantings. Certain plants may help prevent these major pests from invading. Solid beds of French marigolds, hairy indigo, and some varieties of Southern peas are effective as trap crops. The main ingredient it takes to grow a first vegetable garden is enthusiasm! Remember the basics; sunshine, water, and fertile soil. The way to real gardening success is to learn from your practical experience of trial and error. The best part is you get to eat your experiments!